NAD+ is short for nicotinamide adenine dinucleotide, a vitamin B3 compound used by every cell in your body. 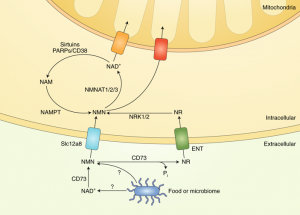 It has been well established for decades that NAD is critical for cellular metabolism as it is directly involved in mitochondrial function and ATP production. Chemically speaking, there is a difference between NAD+ and other forms of NAD. NAD+ is the oxidized form of NAD while NADH is the reduced form of NAD. We are currently interested in the oxidised form of NAD+. 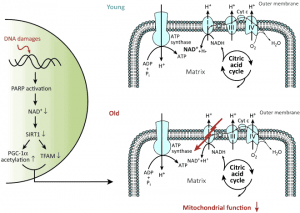 Not only is it essential for mitochondrial function but more recently it has been discovered that it is also in involved with DNA repair and epigenetic signalling through its regulation of sirtuin enzymes. On top of this, NAD+ may also increase levels of cyclic ADP-ribose, which is a messenger molecule responsible for the exchange of information inside and outside of cells. NAD+ is an essential direct cofactor of key enzymes responsible for longevity called sirtuins. Sirtuins, specifically SIRT1 and SIRT3, are intimately related to longevity through their control of gene expression and require NAD+ for their activity. Research into the sirtuins continues to yield substantial information on how to control aging. By activating these sirtuins, we’re able to gain control over anti-aging “switches.” SIRT enzymes “turn off” certain genes that promote aging, such as those involved in inflammation, in fat synthesis and storage, and in blood sugar management. Researchers have found that NAD+ levels decline with age and believe this decline may be directly related to aging. NAD+ levels decline in everybody as they age regardless of your personal health, diet, or physical fitness. NAD+ levels decrease by 40% over the age of 60. Many NAD+ researchers believe if we can artificially raise NAD+ levels through supplementing it can trick the body’s cells into thinking we’re younger. A research team led by Dr. David Sinclair of Harvard Medical School found that “raising NAD+ levels in old mice restores mitochondrial function to that of a young mouse.” In other words, “Examining muscle from two-year-old mice that had been given the NAD-producing compound for just one week, the researchers looked for indicators of insulin resistance, inflammation and muscle wasting. In all three instances, tissue from the mice resembled that of six-month-old mice. In human years, this would be like a 60-year-old converting to a 20-year-old in these specific areas.” Human studies are also underway to determine if similar benefits occur for us however results will be a few years off yet, although initial results are encouraging. NAD+ is produced via the pathways indicated below. 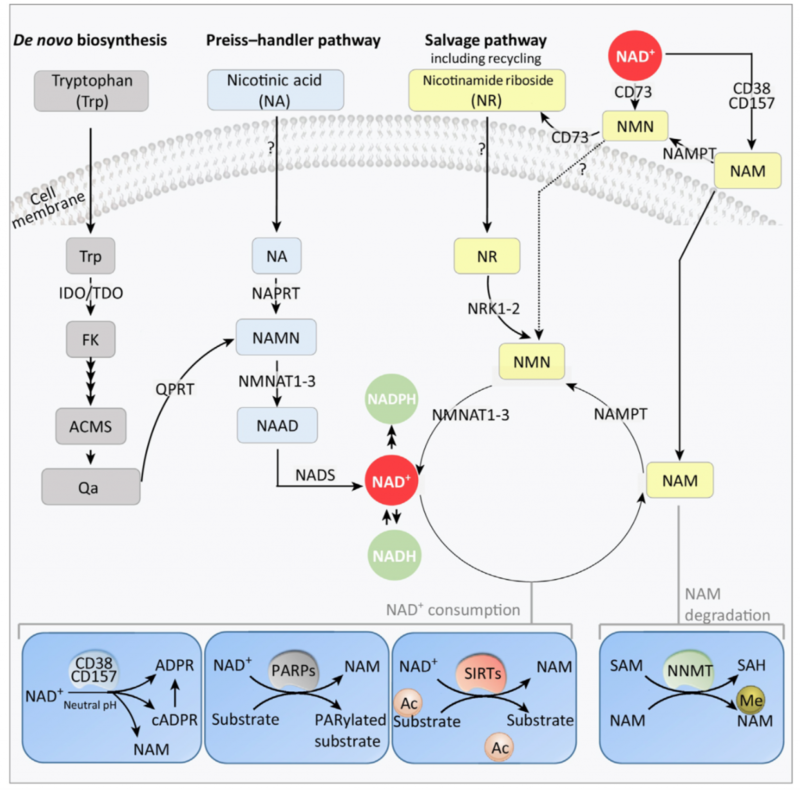 By far, the greatest source of NAD+ is via the salvage pathway where NAD+ is recycled from NAM, NA, NR, or NMN. We can take advantage of this and supplement the precursors Nicotinamide Ribose (NR) and NMN to help increase NAD+ levels. These supplements have been proven to increase endogenous NAD+ production in peripheral organs. Exogenous NAD+ definitely does cross the blood brain barrier through the Connexin 43 gap junction. Exogenous NAD+ easily enters the hypothalamus to significantly increase NAD+ levels in the brain. The increased NAD+ in hypothalamus has a strong effect on metabolism, increasing energy expenditure and decreasing hunger. NMN and NR precursors are not able to cross the blood brain barrier and impact NAD+ levels in the hypothalamus. This might explain why NAD+ clinics in the US have found success treating addictions and other brain imbalances with IV NAD+ and why NR and NMN have not been used in similar fashion. NR and NMN have however been shown to restore NAD+ levels in the peripheral tissues. NAD+ itself cannot enter the cell in peripheral tissues. It first must be converted into NMN or NR where it can be taken up into the cell and then converted back into NAD+ before entering the mitochondria. This process is not the most efficient for boosting peripheral intracellular NAD+ levels where it may be more efficient to use the NR or NMN prescursors. Ideally to increase intracellular levels of NAD+ both within the brain and peripheral tissue a combination of NAD+ and either NR or NMN would appear to be the best option. Our Pharmacy supplies NAD+ infusions, NAD+ SubQ injections and NAD+ enteric coated capsules with a valid doctors prescription. We now recommend to empty the capsule contents under your tongue and use them sublingually. We also supply Nicotinamide Riboside (NR) capsules which is a NAD+ precurser proven to increase NAD+ levels in the peripheral organs. Contact us for details. For more in depth information on NAD+ you are required to log into the free members section. Click on either Existing members or Set up a new account to enter restricted area.